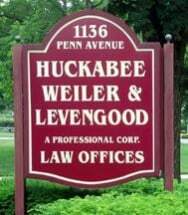 At Huckabee, Weiler & Levengood, P.C., in Wyomissing, Pennsylvania, we are a general practice law firm with a focus on family law. Established in 1985, we have been proudly serving the needs of individuals, families and businesses in Wyomissing, Reading, Berks County and throughout southeastern Pennsylvania ever since. Each of our attorneys at Huckabee, Weiler & Levengood, P.C., has over 30 years of experience in one or more areas of the law. As such, we have the deep legal and hands-on practical knowledge necessary to help individuals, families and businesses facing a variety of legal issues. Our goal is and always has been to give our clients the best available sound legal counsel, vigorous courtroom representation, and exceptional individualized and empathetic attention. In addition, our law firm accepts all major credit cards for our clients' maximum convenience.